Here's a nice quick weeknight meal, this stuffed pork chops recipe is filled with spicy Monterey Jack cheese and then soaked in Franks Red Hot sauce before going on the grill. You only need to let the stuffed chops sit an hour in the Franks Red Hot sauce - just enough time for your garlic baked potato recipe to cook first. 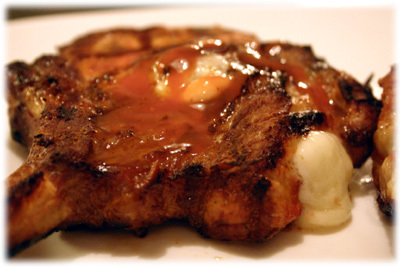 For this recipe you want to select pork chops thick enough to be stuffed. 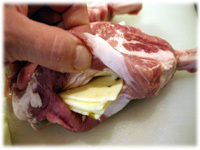 Chops at least 1" thick allow you to cut a slit and make a pocket for stuffing the cheese in. Sometimes for grilled pork chop recipes like this I'll just buy a small pork rib roast and cut my own chops, just slice down between the bones. That way their as thick as you want. If you let them sit longer in the Franks they'll have even more buffalo-style flavor. Note: for best results let the stuffed chops marinate at least 1 hour. Lay a chop on it's side and carefully begin making a slit into the side of the it. 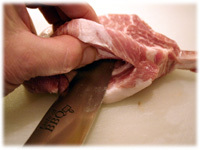 Work your knife towards the center of the chop but don't cut all the way through. Your making a pocket in the center of the chop for the cheese. If you cut too far the cheese might leak out when grilling. Cut the Monterey Jack cheese into pieces small enough to stuff into the pocket of the chops. Put as much cheese in as you can without bursting the pork chop. 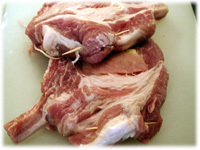 Close the slit in a stuffed pork chop by "sewing" a toothpick back and forth across the opening. This helps keep the melted cheese in the chop a little better. 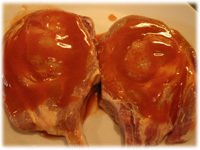 Slather both sides of each stuffed pork chop with Franks Red Hot sauce and cover for at least an hour. Clean and oil the grates and preheat your BBQ to 500F - 525F. 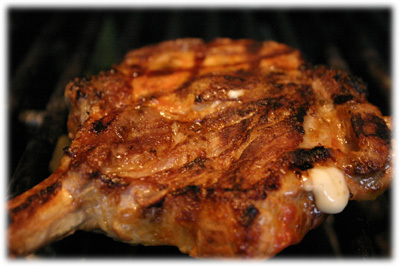 After the stuffed pork chops are marinated and the grill has reached cooking temperature place the stuffed chops on the grates and close the lid. After 6 - 8 minutes flip the chops. Give the chops another 6 - 8 minutes on the second side and then remove them from the grill.